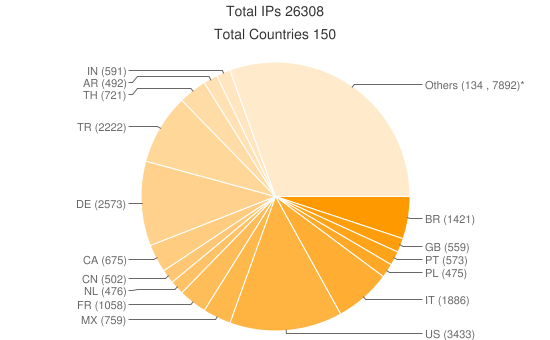 Data recovered from a recently active Pinch command and control server, moretds.org (formerly moretds.in) indicates that 26,308 IP addresses uploaded data to the server. The top three countries affected were the US, Germany and Turkey but there was a considerable geographic distribution with a total of 150 countries affected. In order to read the data PinchParserPro 2.2.2.2 had to be used, which is an older than version than what F-Secure used (PinchParserPro 2.3.1.7) in 2007. It is interesting that such an old version is still being successfully deployed. While investigating the recovered data, credentials associated with government accounts were discovered. One of the victims of the malware was the Ministry of Foreign Affairs of the People’s Republic of China. While there has been much attention on malware attacks emanating from China, China is also a victim of malware attacks. In fact, a recent cyber-crime report by Symantec revealed that Chinese users were the most victimized by online crime. While there is often an emphasis on the latest malware threats, old malware persists and continues to be very effective. In addition, attackers are able to compromise government systems using these outdated tools. And, even if the attackers did not intend to compromise these system — and I don’t think they did — attackers are, in general, beginning to realize that not all compromises are the same and that there may be additional value that can be extracted from particular compromised machines.